At the risk of romanticizing this ever-so-slightly, this week's Muffin Monday assignment was like a date with destiny! It's no secret that for the past two Muffin Mondays, I have either thought about, or have gone ahead and added, cream cheese to my muffins. How happy was I, then, with the discovery that this week's muffins needed no excuse? These Cheesecake Muffins were the perfect way to kick off not only the Labour Day weekend, but a weekend of my early birthday celebrations, too. There's just something about that velvety texture that really knocks my socks off. On the topic of birthdays, I have always loved them. My love for birthdays has nothing to do with presents or attention, I just have always felt that I've earned my new age, and nine times out of ten, I feel fiercely proud of the things I've seen, done, and accomplished over the previous year. Birthdays are a time for reflection, a time to celebrate a year well spent, and to give an optimistic nod to the future and to all that the upcoming year holds. Never have I experienced a crisis during my previous milestone birthdays: I was really excited to turn 20 and to leave my teens behind; I felt I had earned every year of my quarter century when the time came; I now have every reason to look forward to what my thirtieth year holds, based on all the goodness currently taking up residence in my life. I've always gotten annoyed with people who would (and sometimes still do) tell me that this feeling will change as I get older. It certainly hasn't changed yet and I'm doubtful it ever will. It's a mindset! A lifestyle. Why not encourage this feeling in people as they age? This is not to say that life has been perfect. I've had my own share of ups, downs, trials, and tribulations over the past several years, but I have a beautiful life nonetheless and I'm extremely grateful for the beautiful people and - yes - the beautiful food that enriches it every day. Birthdays, to me, seem like the best day of the year to sit back and take stock of your blessings, and hopefully, to be surrounded by those people and that food that make life so fulfilling. While I made these on Saturday morning, my big brother was sleeping upstairs, having arrived late in the night from Toronto for a quick, weekend trip. He got to wake up to the smell of these baking, a fact he seemed to enjoy an awful lot, and that made me pretty happy. Even better? My Cheesecake Muffins were then packed away into the car with us and en route to the country, to be eaten on a sunny, quiet Sunday morning with our parents and his daughter: my devastatingly charming and gorgeous niece, who had been staying with her Nanny and Poppy while her mom and dad moved house. 1. Preheat the oven to 390F/200oc/Gas 6/fan oven 180oc. Line a muffin tin with 12 paper cases. Sift the flour and baking powder into a large bowl, then stir in the sugar, orange rind and salt. Beat the eggs and milk together in a jug or bowl, then stir in the butter and gently mix into the dry ingredients to make a loose, slightly lumpy mixture. Do not over-mix or the muffins will be tough. 2. Mix together the soft cheese and sugar for the filling. 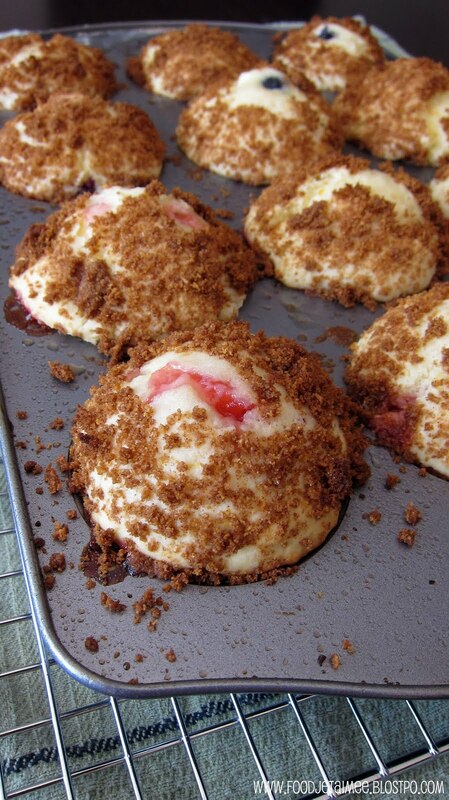 Half-fill the paper cases with the muffin mixture, then push half a strawberry into each. Top with a teaspoon of sweet cheese, then spoon over the remaining muffin mixture to cover and fill the muffin cases. I didn't make jumbo-sized muffins this week, now that I finally have a 12-cup muffin tin. Once again, however, I opted not to use muffin cups or liners. I like the result better when I just spray my pans. Also, because this recipe calls for strawberries and they are no longer in season, I decided to do two things: I filled 6 of the muffins with my mother's Strawberry Freezer Jam, and for the other 6, I used some gorgeous, Annapolis Valley blueberries. They're still in season here for another couple of weeks, so it was a great excuse to showcase them. I wanted to make these muffins even more like cheesecake, so I also added a Graham Cracker Crumble to the top. Cheesecake Muffins with fresh, Valley blueberries. Cheesecake Muffins with strawberry preserve. As I said to Anuradha last week, I think baking is one of the best gifts, both to give and receive. It's a gift from the heart, and it made this nearly-30-year-old's heart pretty happy to share these Cheesecake Muffins with my family. Make sure you check out all the other Muffin Monday bakers to see what they did with their Cheesecake Muffins! YAY! for birthday weekend! Its this thursday right? Love the crumb topping! Your muffins look gorgeous Aimee! The crumb topping is a great addition! I also like how you used your strawberry freezer jam in some of them. What an inspired idea! Beautiful--and I bet they were tasty, too! Can't begin to tell you how absolutely delicious these muffins were. I had the blueberry one and later realized you had strawberry as well. A muffin without a crumb topping is just a naked muffin!! Keep the crumb toppings coming. I am bookmarking this! Loooooove the cream cheese, we used to make these in Colorado, but with tart cherries. Oh sooo good! What beautiful muffins! I've been (gulp) 30 for 3 months & it still feels weird! I'll trade w ya! I love birthdays, too! And I love how you think. 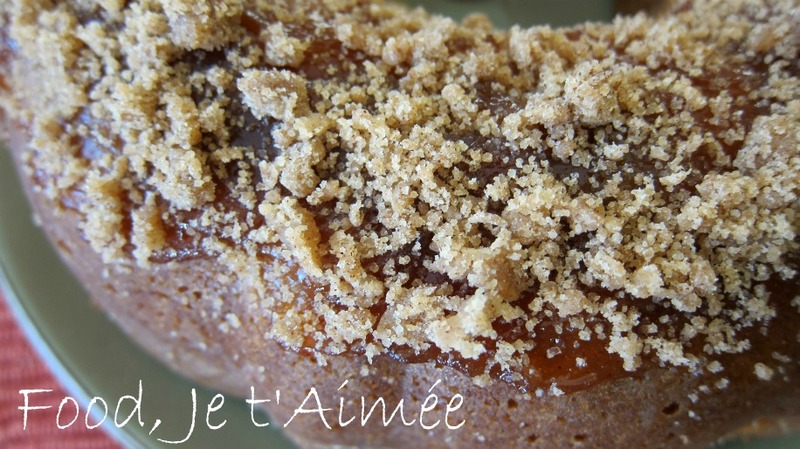 This recipe is so good with topping, and I only did a dozen with streusel, just to compare. Happy to be baking with you again! You're really getting the hang of these muffins!..lol Love your outlook on life and birthdays, it's the best way to enjoy each year. The muffins are almost as good looking as the (almost 30) baker :-) Great Job! Great post Aimee, I love your perspective on birthdays. Though it is nice to get presents, it really is more than that. I love the addition of graham crumble! baking is indeed a labor of love! great minds do think alike! love the graham cracker it really rounded things out! your muffins looks so beautiful happy muffin monday!